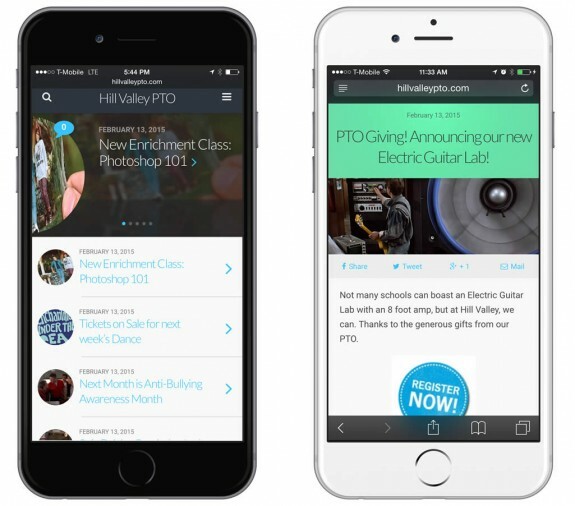 Home » General News » Your Mobile Site just got a Huge Upgrade! 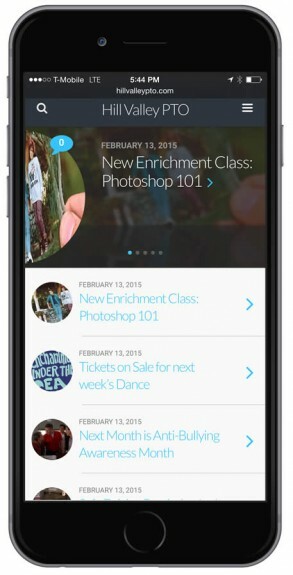 We are super excited to announce a brand new mobile viewing experience for your groups website on a mobile phone! We were way ahead of the game 5 years ago when we first announced our mobile version, but mobile phones have come a long way since then and we are progressing with them. Want to take a look at the new Mobile Theme right now? Head to http://hillvalleypto.com/ on your mobile phone! Our new mobile theme is easy to read, easy to set up and provides a beautiful browsing experience. We highly recommend using Featured Images in your news posts to take full advantage of this beautiful mobile viewing experience. You can see in the example above the new Home Page with easy to navigate News Posts. On the right, you can see a specific news post. Note that the green color, the image and the content can all be controlled by a super easy set of controls. Gone are the days of Text Only pages and old clunky fonts and designs. As you can see from our Older Version above, the Mobile theme has come a long way! We are excited to share this new Mobile theme with you and look forward to your feedback! In addition to making design modifications to the home page and inner pages, we also have a much cleaner navigation system that allows for quick customization with icons and arrangement. Now your Parent Group’s Families can access your site with ease from just about any screen imaginable. This Smart Phone View is available to our Premium and Premium Plus Members. If you would like to upgrade to take advantage of this amazing theme, please visit our Upgrade Center. Comments Off on Your Mobile Site just got a Huge Upgrade!